This months theme was "Murder and Mayhem", let's get to it! First up was this Three Dark Crowns inspired sticker by Jamila Mehio. This is such a dark, twisty series about three sisters who are destined to kill each other for their crown, so it's very on brand for this box. Next up was my favorite item in the box: a Game of Thrones woodmark by Ink and Wonder Designs. 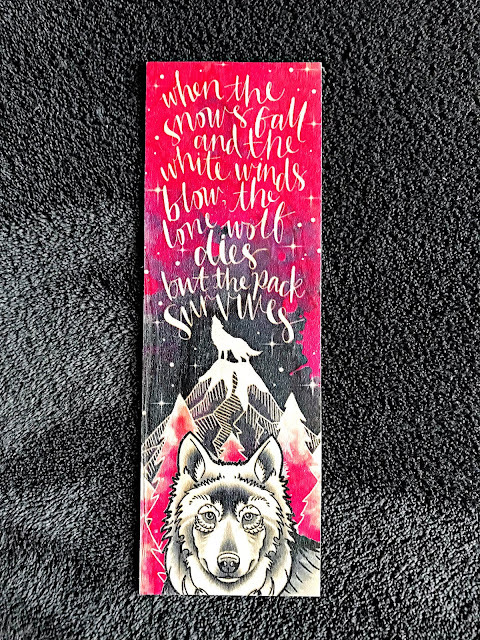 I've gotten a few of these wooden bookmarks in past boxes and I'm always so impressed by them. The quality is sturdy and the designs themselves are so nice. 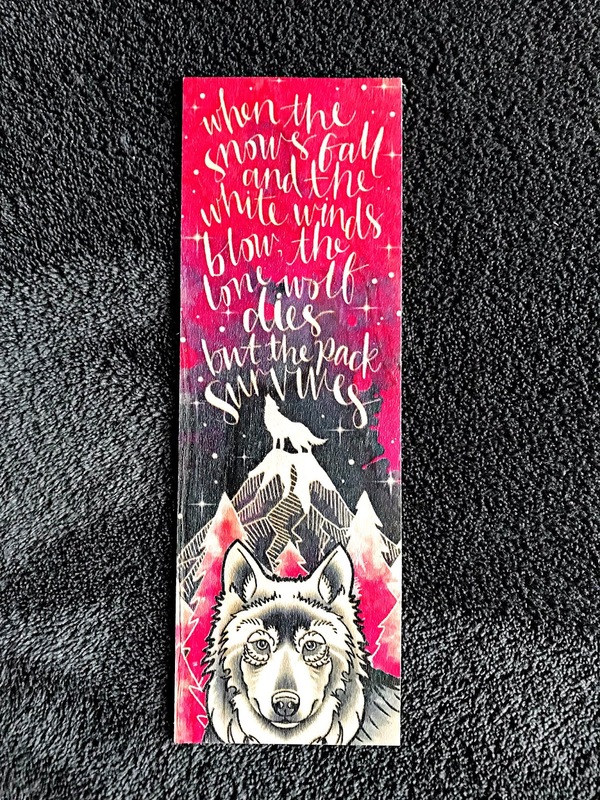 This is also one of my favorite quotes from the series (I would definitely be a Stark if I lived in Westeros), so I'm really happy with this. I love a good travel mug and this one by Catarina Book Designs is no exception. 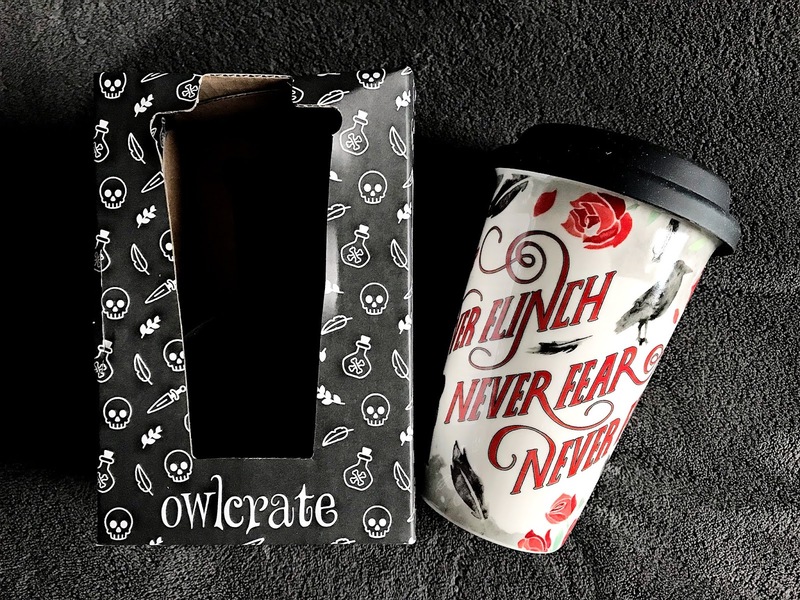 It's based off Nevernight, which I've never read, but the design and quote on the mug make me want to bump it up on my TBR. The mug also came with a silicone band to protect your hands when it's too hot, but I like it without since then you can actually see the design. 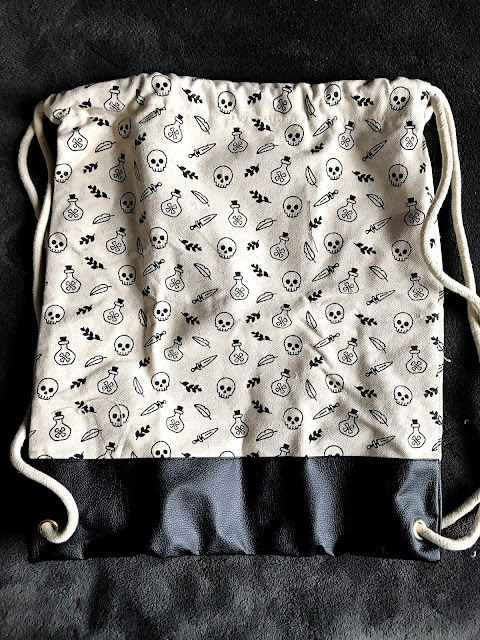 I love that this drawstring bag, designed by Michelle Gray, is not only roomy and even has an inside pocket, but that the design is the same as the box the travel mug came in. It's little details like that that make me love OwlCrate. You all know how I feel about candles. I have an entire storage space dedicated to them. I love fruity scents as well, so this one by In The Wick of Time is right up my alley. 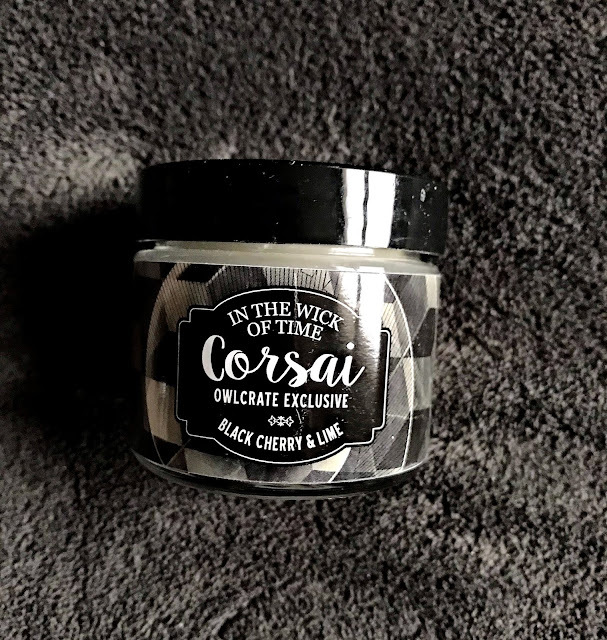 It's such a sweet scent that will be perfect for Spring. The book for this month was Four Dead Queens by Astrid Scholte. This story follows Keralie, a talented thief, who steals an important package from an honest messenger leading them to unearth a dangerous conspiracy unfolding in their realm. 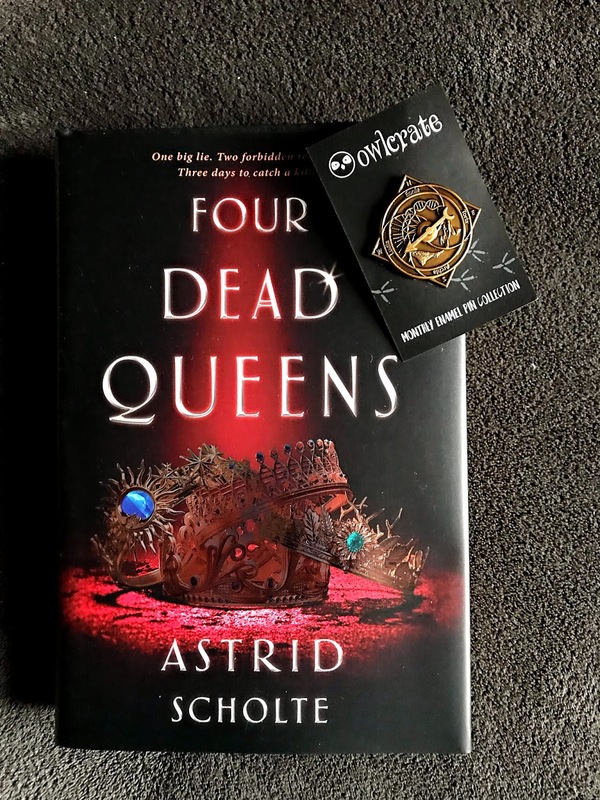 The unlikely pair discover that someone has murdered the four queens that rule over their lands, and go on a desperate mission to uncover who the killer is. I had actually gotten a little chapter sampler of this at Comic Con back in October, so I'm really excited to now have the full finished copy. It sounds like my kind of murder mystery. 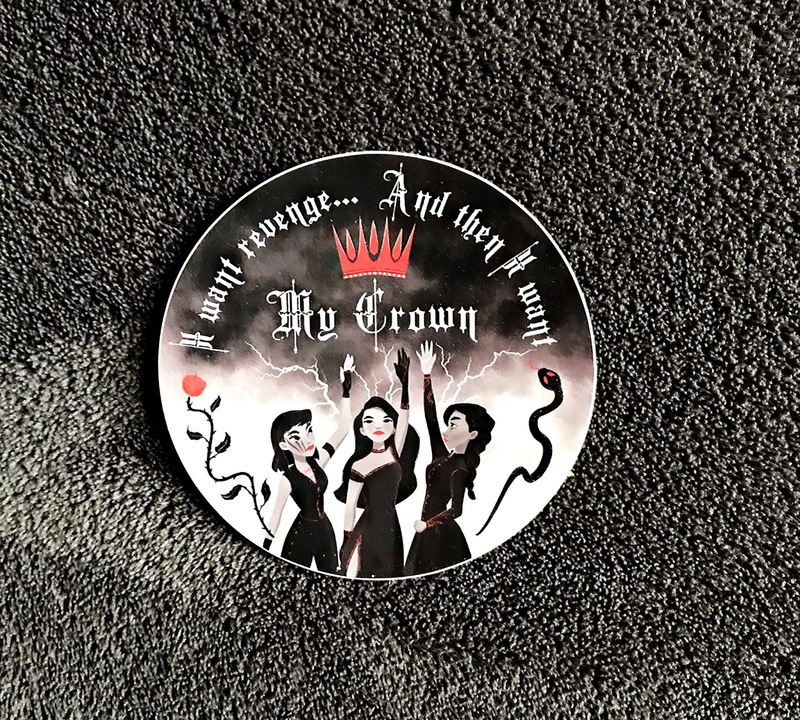 Also, the pin for this month was designed by Iron and Ink Designs and it has a fun compass design inspired by the four queens of Quadara. Lemme know what you thought of this months box!